Now you can Follow Treasured Heirlooms Crochet on Facebook! Some are brand-new, most are used; age and condition vary from near-mint recent publications to not-so-hot well-used editions. Please note that these publications come from various sources, and may have been stored in a smoking environment. I'll try to note obvious defects, but may miss something. Unless otherwise noted, I have only one of each publication. Due to copyright laws, I can only sell patterns in the form in which they are published -- no photocopies, scans, pdf's, etc. First come, first served, and all patterns sold "as is." Please Email me with any questions before ordering. I'll be adding to the list periodically, so if you're looking for something special, keep checking back! Shipping & Handling will be added to all orders, as well as 6% sales tax for MI residents. 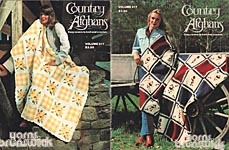 Country Afghans, Brunswick Worsted Mills Inc., 1981. Designs include: KNIT Reversible Cable Afghan, Traditional Nantucket Afghan, Dutch Country Afghan, Twin Leaf Afghan or Bedspread, Nosegay Aran Afghan, Tulip Afghan; CROCHET Aran Isle Afghan, Traditional Ripple Afghan, afghan stitch Autumn Medley Afghan, Flower Basekt Afghan, Buttercup Granny Square Afghan, Soft and Fluffy Plaid Baby Afghan, Poinsettias in the Snow Granny Afghan with matching Tree Skirt and Stockings, afghan stitch Gingham and Daisy Afghan. Good used -- center pages detached from staples. Pages seem yellowed, but I think they were off-white to begin with. 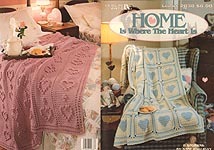 Home Is Where the Heart Is, designed by Anne Halliday, Leisure Arts, 1996. Designs include: Teddy Bear Love, Tender Embrace, Cookie Cutter Hearts, Fireside Chat, Hugs & Kisses, Heart Silhouettes, Tea Time, Stenciled Hearts. Very good condition. Bernat Handicrafter No. 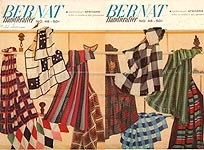 48: Featherweight Afghans to Knit Or Crochet, Emile Bernat & Sons Company, 1955. Designs include: 6 to KNIT (some with crochet edgings, and a Domino pattern with crochet spots); and 6 to CROCHET. This was apparently a favorite of the former owner -- name on cover, folded in half possibly to carry in workbag, general overall wear. 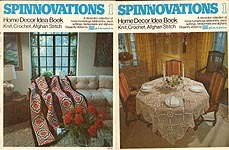 Spinnovations 1: Home Decor Idea Book - Knit, Crochet, Afghan Stitch, Spinnerin Yarn Company, Inc., 1975. 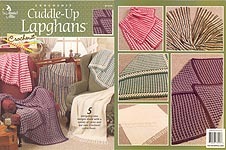 Designs include: KNIT Green and White Afghan, Popcorn Square Afghan. Chair Covers; CROCHET Spanish Motif Afghan (afghan stitch), Green Tablecloth, Pinwheel Tablecloth, Orange and White Tablecloth, Hairpin Lace Tablecloth, Red and White Afghan (afghan stitch), Star Motif Bedspread, Green Motif Bedspread, Loden Bedspread, Green Table Runner with Matching Place Mats, Twist St. Mat, Afghan St. Mats, Ripple Mats, Indian Afghan (afghan stitch), Popcorn St. Afghan (afghan stitch), Geometric Afghan (afghan stitch), Yellow Tablecloth, Chevron Popcorn Afghan (afghan stitch), Nautical Afghan (afghan stitch), Lace Crochet Tablecloth. NOTE: it looks like all of these items are made with yarn of various weights. Definitely used, but everything is here and readable. 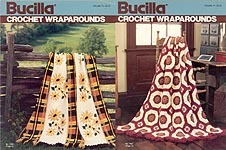 Bucilla Crochet Wraparounds, Bucilla, 1984. Designs include: Daisy Plaid (afghan stitch/ Tunisian), Aran, Colonial Roses (embroidered afghan stitch/ Tuniisan), Granny Ripple, Chevron Ripple, Diamond, Floral Octagons. Very good condition. 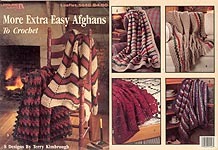 More Extra Easy Afghans to Crochet, designed by Terry Kimbrough, Leisure Arts, Bucilla, 1992. Designs to crochet using two strands of worsted weight yarn held together include: Ripple Afghan, Wave Afghan, Zig- Zag Afghan, Simple Stripe Afghan, Tweed Afghan, Shell Afghan, Puff Stitch Afghan, Motif Afghan. Very good used condition. 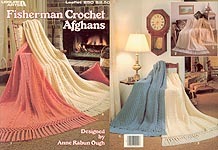 New Granny Afghans, American School of Needlework, 1989. Designs include: Country Granny, Grape Fizz, Diagonal Diamonds, Delft Tiles, Daffodil Afghan, Sweet Memories, Basket Quilt, Snow White Granny, Rose Garden. Very good condition, though may have very very slight scent of cigarette smoke. 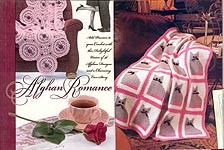 Afghan Romance, The Needlecraft Shop, 1999. 160- page hard- cover book; designs include: COMFORTING COUNTRY -- Mountain Sunrise, Reflections, Faithful Friends, Tropical Evening, Spring Melody, Grandma's Favorite; ANTIQUE TREASURES -- Roses & Lace, Wildflowers, Midnight Mosaic, Eternal Blooms, Tailor's Fancy, Anticipation; CITY SOPHISTICATION -- Sculpted Sapphires, Inlaid Amethyst, Grandiloquence, Carved Ivory, Contradition, City Lights; EVERYDAY DELIGHTS -- Circle of Love, Picture Perfect, Musical Days, Country Communion, Love's Devotion, Rave Reviews; ENGLISH EXTRAVAGANZA -- Royal Bows, Picot Paradoz, Petunia Potluck, Symphony in Violet, Sweet Impressions, Daffodil Garden; HOLIDAY MAGIC -- Kitten Soft, Royal Treatment, Christmas Fever, Chorus of Lace, Fireside Glow, Yuletide Rose, Poinsettia Delight; BABY'S BEST -- Special Blesslings, Sweet Dreams, Baby Stars, Double Delight, Pastel Puzzle, Butterfly Kisses, Zigzag Adventures; GENTLEMEN'S DOMAIN -- Solid Comfort, Interlaced Images, Morning's Glow, Peaceful Surroundings, Warm & Welcome, Revelations; LASTING REMEMBRANCES -- Wedding Lace, Timeless Treasure, Enduring Love, Sunhine & Roses, Endless Romance. Excellent condition. Note: Additional postage may be required for shipping outside of the US. 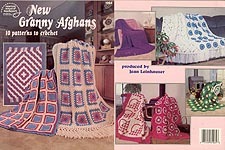 Afghan Sentiments, The Needlecraft Shop, 1998. 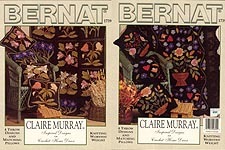 160- page hard- cover book; designs include: BOUQUETS -- Flower Garden, Clematis, Pink Rosebuds, Lush Delights, Floral Tiles, Roses in Lace, Painted Daisy, Forget- Me- Not, Rose Trellis; SYMPHONIES -- Shells in Song, Soothing Lullaby, Lavender Echoes, Gentle Serenade, Sunlight's Refrain, Classical Harmony, Hearts a' Flight, Ode to Pearls; CHARMS -- Triangle Treasure, Ohio Star Variation, Tulip Field, Cloudy Days, Flying Rainbows, Americana Star, Hexagon Floral, Tulips in Bloom, Shining Stars, All- American Cats; LEGENDS -- Nativ Colors, Twilight Trails, Thunderbird, Cool Water, Country Meadows, Indian Summer, Rustic Cabins, Square Dance, E Pluribus Unum, Brave Image; ROMANTICS -- Milady's Lace, Marbled Elegance, White on White, Evergreen Classic, Gothic Romance, Leaves of Gold, Greek Silhouette; TIDINGS -- Holly Patch, Wreaths o' Lace, Victorian Poinsettia, Candy Cane Throw, Snowflake Hexagons, Christmas Tree Quilt, Yuletide Ribbons, Holiday Hearts, Santa's Bouquet, Beaded Garlands. Very good condition. 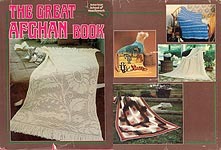 The Great Afghan Book, American School of Needlework, nd. 160- page hard- cover book; designs include: KNIT Mohair Victorian Lace, Lemon Lime Shrbet, Burgundy Honeycomb, Criss Cross, Autumn Glory Ripple, Aran Isles Fisherman, Puffpetal, Starflower, Geranium, Chocolate Medallion, Desert Flwoer, Whitby Tweed, Golden Glow, Springtime Baby Afghan, Morning Glory Baby Afghan, Sweet Dreams, Happy Event (duplicate stitch design); CROCHET Forget- Me- Not, Snowbaby, Baby Rickrack, Colorado Stripes, Persimmon, Blue Skies, Gtanny Ripple, Rainbow Ripple, Kittens, Springtime Ripple, Fall Leaves Ripple, Contemporary Granny, Irish Mist Fisherman Crochet, Highland Glen, Empress Coverlet, Christmas Granny, Filet Spring Flower, Snowflowers, Golden Amber Granny, Harvest Festival, Daisy Field, Clamshell, Fiesta, Diagonal Diamonds, Sunshine, Afghan Afghan, Six- Pointed Star, Log Cabin, Sunrise, Williamsburg; CROCHET PICTURE AFGHANS -- Dutch Pinwheels, Desert Sunset, Party Time, Grandpa's Farm, Jungle Friends, Magic Castle, Butterflies, Ship of Dreams, Tulip Quilt; AFGHAN STITCH (TUNISIAN) WITH CROSS STITCH -- Stitch English Garden, Victorian Roses, Imperial Garden, Moorish Tiles, Sweet Violets, Bedtime Tales (zoo animals); AFGHAN STITCH (TUNISIAN) Spearmint Leaves, Indian Blanket; BROOMSTICK LACE Candy Mint Baby Afghan, Two- Tone Lace, Raspberry Flip, Ruffles and Lace Baby Afghan; HAIRPIN LACE Light and Lovely, Peek- A- Boo Baby Afghan. Heavy wear to dust cover, but book itself in excellent condition. 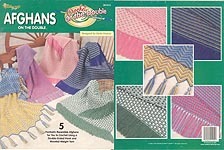 Patons Colourful Afghans to Crochet, Coats Patons - Coats Canada Inc., 1996. Digest- Size book with 5 designs in worsted weight yarn; Lily Pond, Floral Tradition, Striped Aran, Casual Mood, Garden Path. Very good condition. 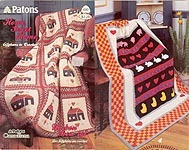 Patons Home Sweet Home Afghans to Crochet, Coats Patons - Coats Canada Inc., 198. Digest- Size book with 8 designs in worsted weight yarn; House on the Prairie (embroidered sc squares) , Rose Trellis (embroidered afghan stitch/ Tunisian crochet strips), Hearth & Home (flower & plain motif squares), Children's Primer (heart, flower, pig, bunny, heart, and chick appliques), Garden of Delight (flower & vine applique on "basketweave" black and white strips), Picture Perfect (sc strips with diagonal popcorn st), Painted Desert (worked in one piece with color changes), and Desert Sand (lengthwise ripple). Very good condition. 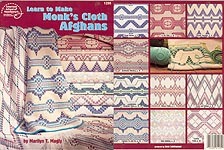 Learn to Make Monk's Cloth Afghans, designed by Marilyn T. Magly, American School of Needlework, 2000. Complete How- To for working with Monk's Cloth, plus designs for Ocean Waves, In the Pink, Purple Passage, Southwest Memory, Mountain Pines, Wheat Fields, Peaks and Valleys, Feathers To and Fro, Baby Babbles, and Country Trails. Notes written on a couple of pages, but in general, very good condition. Sampler Afghan on the Double, designed by Darla Fanton The Needlecraft Shop, 2000. 24 blocks of unique stitches and textures flow together to create a stunning reversible afghan made with worsted weight yarn and double- ended hook. Excellent condition. Fisherman Crochet Afghans, designed by Anne Rabun Ough, Leisure Arts, 1983. Patterns include: Limerick, Lodonderry, Galway, Armagh, Dublin, and Cork. Very good condition. 101 Knit and Crochet Ripple Stitches, by Jean Leinhauser, American School of Needlework, 1997. 41 to KNIT and 60 to CROCHET. New. 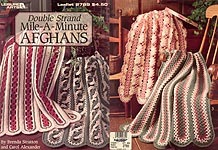 Ripple Afghans to Crochet, designed by Shala Johnson, Leisure Arts, 1989. 5 designs to crochet. Slight page yellowing, but overall very good condition. 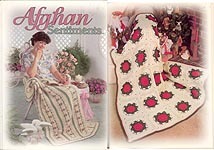 Very Pretty Afghans, designed by Mary Lamb Becker, Leisure Arts, 1997. 10 designs to crochet. Cover & edge wear, but overall good condition. 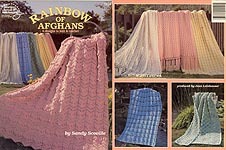 Rainbow of Afghans, designed by Sandy Scoville, American School of Needlework, 1992. 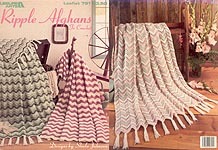 Six single- color afghans, 2 to KNIT (Peach Cables and Ridges and Lace) and 4 to CROCHET (Rose Chevron, Blue Triangles, Green Lattice, or White Shells. Very good condition. May smell slightly of cigarette smoke. 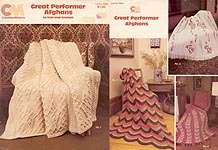 Great Performer Afghans to Knit and Crochet, Columbia- Minerva, 1981. KNIT Garter Stitch Afghan; CROCHET Aran Afghan (afghan stitch/ Tunisian), Embroidered Afghan (afghan stitch/ Tunisian), and Scalloped Ripple Afghan. Cover & edge wear, but overall good condition. 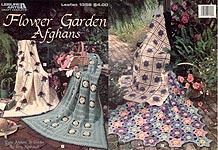 Flower Garden Afghans, designed by Terry Kimbrough, Leisure Arts, 1991. 8 designs to crochet. Very good condition. 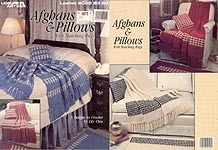 Afghans & Pillows with Matching Rugs, designed by Lily Chin, Leisure Arts, 1990. 5 designs to crochet. Some cover & edge wear; otherwise very good condition. 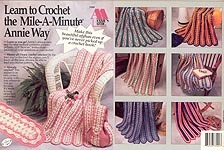 Learn To Crochet the Mile-A-Minute Annie Way, by Annie Potter, Annie's Attic, 1991, 1992, 1994, 1997. Large print and diagrams, detailed step- by- step instructions make it easy to create a beautiful afghan even if you've never crocheted before. Pattern for totebag and instructions for several color combinations also included. 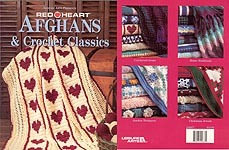 Red Heart Afghans & Crochet Classics, compiled & edited by Janica York, Leisure Arts, 1996. 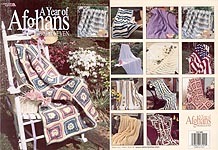 Designs include: AFGHANS - Diamond Weave, Ruby Red Hearts, Bobbles, Star Sapphire, Crystal Crosses Baby Blanket, Pearls on the Half Shell, Sparkling Gems, Emerald Isle, Diamonds & Pearls, Rippling Shells, Country Gingham, Checkered Past with Pillow, Merry- Go Round Baby Afghan, Study in Brown, Picnic Pack- aghan, Fiesta Flair with Pillow, Southwestern Sunset, Blue Sampler, Loopy Lambs Baby Afghan & matching Booties, Royal Ripple, Buffalo Checks, Star- Stitched Stripes, Grand Gardenias, Sunflowers, Morning Glories, Kittens in the Garden, Daisy Delight, Sweetheart Roses, Pineapple Parfait, Peppermint Ripple, Blanket of Snowflakes, Double Irish Chain, Park Avenue, Winter White, Cozy Cables, Eye Dazzler Baby Afghan, Family Tartan; Hat & Scarf, Timeless Tree Skirt, Super Stocking, Angelic Ornaments, Classic Pullovers in adult & kids' sizes, Snowflake Ornaments, Striped Sweater, Floral Placemat, Cropped Cardigan, Winter's Garden Coverlet, Bobbles Rug, Shimmering Filigree ladies' tunic. Very good condition. A Year of Afghans, Leisure Arts, 1992. 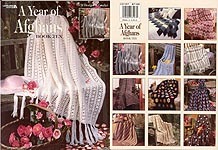 52 designs to crochet, 144 pages: Frosty Flowers, Aran Comfort, Wintry Day, Patchwork Stars, Cozy Log Cabin, Love Songs, Hugs & Kisses, Sweet Hearts, Country Plaid, Baby's Rainbow Granny, Tulip Kisses, Field of Daffodils, St. Patrick's Wrap, Coming Up Roses, spring Dream, Easter Eggs, Orchard Whimsy, Grandmother's Garden, Baby's Keepsake, Milady's Fans, Darling Daisies, Lilac Lane, Cat's Meow, Father's Favorite, Bride's Lace, Roses Remembered, Wedding Ring, Carefree Cover- Up, Summer Shells, Ocean Breeze, America, Brown- Eyed Susan, Waves of Grain, Victorian Summer, Country Lane, Golden Rule, Rodeo Stars, Rose Garden, Primarily For Kids, Autumn Blaze, Warm Tradition, Campfire Blanket, Magnificent Mums, Rich Fall Stripes, Hayride Wrap. Team Spirit, Harvest Home, Evergreen Inspiration, Blanket of Snow, Cozy Appeal, Majestic Pine, Simple Snowman. Slight cover wear & spine wear. Otherwise very good used condition. A Year of Afghans, Leisure Arts, 1990. 12 designs to crochet. Corners bent from mailing, slight cover wear. Otherwise very good condition. 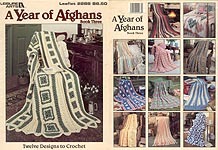 A Year of Afghans, Book Two, Leisure Arts, 1981. 12 designs to crochet. Very good condition. A Year of Afghans, Book Three, Leisure Arts, 1992. 12 afghans in worsted weight yarn. Cover wear, bent corners from mailing -- overall good condition. A Year of Afghans, Book 5, Leisure Arts, 1994. 12 afghans in worsted weight yarn. Very good condition. 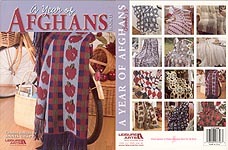 A Year of Afghans, Book Ten, designed by Shobha Govindan, Leisure Arts, 1999. 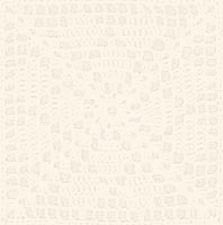 A design a month in worsted weight yarn. BRAND NEW. 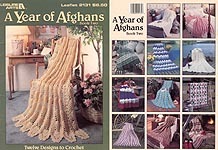 A Year of Afghans, Book Eleven, designed by Ruth Shepherd, Leisure Arts, 2000. A design a month in worsted weight yarn. BRAND NEW. 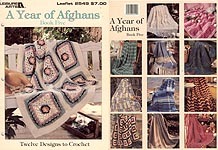 A Year of Afghans, Book 12, designed by Barbara Shaffer, Leisure Arts, 2001. 12 afghans in worsted weight yarn, including an American Flag. Good used condition. 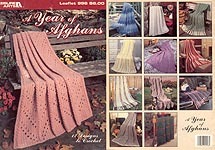 A Year Of Afghans, Book 15, designed by Annis Clapp, Leisure Arts, 2004. 12 crochet designs. BRAND NEW! Double Strand Mile- A- Minute, designed by Brenda Stratton and Carol Alexander, Leisure Arts, 1995. 7 designs. Excellent condition. 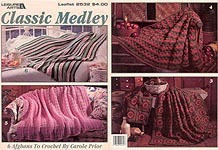 Classic Medley, designed by Carole Prior, Leisure Arts, 1994. 6 designs to crochet. Like new. 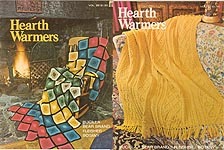 Hearth Warmers, Bernhard- Ulmann, 1974. 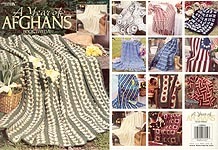 A dozen unique afghan designs in KNIT, CROCHET, Broomstick crochet, and embroidered Afghan Stitch (Tunisian). Good used condition. 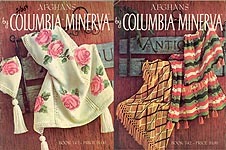 Afghans by Columbia - Minerva, Book 742, Columbia- Minerbav Corp., nd (I'd say '70's). 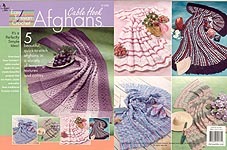 KNIT Plaid, Feather and Fan, Rosebud, Striped, Leaf Pattern, Garter Stitch, and Blue and White; CROCHET embroidered afghan stitch (Tunisian) Flower and Fruit, and Rose afghans; Striped, Ripple, Patchwork, Daisy, Two tone Block, Black With Roses, and Loop Stitch Motif. "Knit" or "Crochet" written next to patterns, some needle sizes circled, name on inside front cover. Otherwise very good used condition. 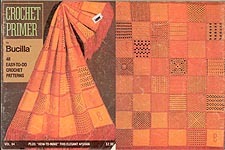 Bucilla Crochet Primer, Bucilla, 1983. 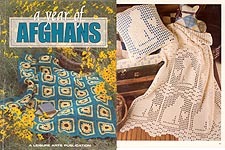 Reprint of book below; 48 easy- to- crochet stitches, plus complete alphabet and instructions for Sampler Afghan. Excellent condition. 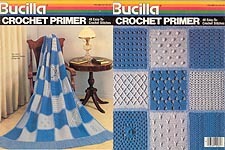 Bucilla Crochet Primer, Bucilla, 1972. 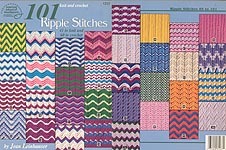 Original edition, 48 easy- to- crochet stitches, plus complete alphabet and instructions for Sampler Afghan. Excellent condition. 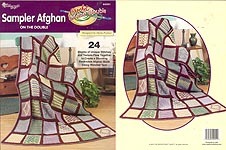 Afghans on the Double, designed by Darla Fanton, The Needlecraft Shop, 2000. 5 reversible designs to crochet usint a double- ended hook and worsted weight yarn. Excellent condition. Crochenit Cuddle- Up Lapghans, Annie's Attic, 2002. 5 designs made with a variety of yarns and the Crochenit cable hook. Like new. 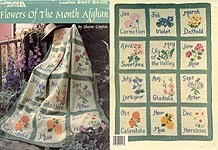 Flowers of the Month Afghan, designed by Sharon Compton, Leisure Arts, 1993. Flowers are embroidered on afghan stitch (Tunisian) blocks: Carnation, Violet, Daffodil, Sweetpea, Lily of hte Valley, Rose, Larkspur, Gladiola, Aster, Calendula, Mum, and Narcissus. SERIOUS CONDITION PROBLEMS: ALL pages pulled out from staples and ripped nearly in half down spine. Spots, stains, wrinkles -- you name it. However, all charts and instructions are present and readable. Claire Murray® Inspired Designs in Crochet Home Decor, Bernat yarns by Spinrite, Ontario, Canada, nd. 4 throw designs and matching pillows: New England Wildflowers, English Garden, Nantucket Cottages, Forget Me Not. Like new. Easy Tunisian Cable Hook Afghans, designed by Carolyn Christmas, Annie's Attic, 2004. 5 quick- to- stitch Tunisian Crochet afghans in a variety of textures and colors. Like new. Treasured Heirlooms Crochet is a subsidiary of Hook And Web Designs . Page, background, and graphics Copyright © 2005, Hook and Web Designs. All Rights Reserved. Technical problems? Contact the Webmaster!